[01:49:29] <JymmmEMC> (03:39:48 PM) dmess left the room. [01:49:29] <JymmmEMC> (03:44:40 PM) LesNewell left the room (quit: "Leaving"). [01:49:29] <JymmmEMC> (03:59:18 PM) BigJohnT left the room (quit: "ChatZilla 0.9.83 [Firefox 1.5.0.12eol/2008121621]"). [01:49:29] <JymmmEMC> (05:20:26 PM) dmess [n=dmessier@76.74.132.165] entered the room. [02:27:59] <jepler> "2000 lb. weight capacity" isn't nearly enough, is it? [02:30:57] <jmkasunich> "For dead loads only; not for lifting"
[02:31:57] <jmkasunich> then why two? [02:33:52] <jmkasunich> $600? you mean the gantry? [02:40:24] <jmkasunich> where did $600 come from? [03:16:38] <jepler> anybody have an opinion on vmware server 1.x vs 2.x? are they both similarly free (as in beer)? [03:17:12] <jmkasunich> skunkworks_: da beast! [03:19:12] <jmkasunich> SWPadnos: do you have room in the driveway for a forklift and forks to fit between the tail of the trailer and the garage door? [03:25:46] <jmkasunich> "in a crate" ? [03:26:48] <jackland> can you send a picture? [03:26:59] <jmkasunich> of the lathe? [03:28:47] <jackland> skid and back up realy fast! [04:18:22] <KimK> I've just plugged in for the first time (just for fooling around a bit) a 5i22 with a 7i33 and a 7i37. Any suggestions or advice? I'd like to learn how to play with the DC I/O and the ladder via the 7i37. [04:20:58] <cradek> hook up an encoder and set it up as a jog wheel? [04:23:33] <KimK> Thanks, I'll look into the LED display card, I didn't know about that. (They keep it "in the back room"? I didn't see it on the web page). I can live with not having outputs, or maybe I'll throw 8 LED's on the 7i37? [04:25:17] <cradek> or you could use the software encoder counter, but it could not count nearly as fast. [04:26:53] <KimK> seb_kuzminsky: Sorry, I didn't explain myself correctly. I meant DC I/O as in general purpose PLC-type I/O. Sorry for the "slang". [04:27:16] <seb_kuzminsky> KimK: so you want to read two TTL signals in quadrature? [04:29:24] <KimK> seb_kuzminsky: Yes, quadrature, but I was afraid that I'd have to use one of the 7i33 servo encoder inputs for a general purpose knob, i.e. feedrate. [04:31:43] <KimK> SWPadnos: Read? So far I only know about the latency test, etc. [04:32:25] <SWPadnos> halcmd show "*.tmax"
[04:32:29] <SWPadnos> halcmd show "*.time"
[04:32:40] <SWPadnos> halcmd show param "*.time"
[04:34:55] <KimK> OK, I'll be sure to look into that. In the Integrator's Manual? Oh, wait, isn't the Hal Manual separate now? [04:36:32] <JymmmEMC> oh, well any pry bar points at least? [04:42:21] <JymmmEMC> is the lathe even suppose to work? [04:43:51] <JymmmEMC> wha cha gonna do with it? [04:44:59] <JymmmEMC> what does camera have to do with a lathe? [04:49:28] <KimK> Goodnight SWP, thanks for the help. Thanks to you too, cradek, seb_kuzminsky. I'll be here awhile yet. [05:33:28] <maddash> is it possible to shift a voltage sine curve positively so that the minimum of the curve is zero and the max is 2*amplitude? [05:50:34] <maddash> are you trying to keep her tethered on a leash? [05:52:01] <JymmmEMC> ok, I'm trying to understand what the diode is doing exactly....I know it's only effecting half the waveform, but I'm not sure how/what it's actually doing. [05:57:54] <KimK> The diode in which figure? [05:58:40] <KimK> Figure 1 ? [06:00:50] <JymmmEMC> ok, then what does C1 do in this case? cause a delay? [06:01:39] <KimK> C1 isolates the zero-impedance-output voltage generator so you can develop a "float"
[06:02:06] <JymmmEMC> how is it 'isolating'? [06:02:35] <KimK> OK, AC coupling. Like on a scope. [06:03:44] <JymmmEMC> Hmm, is C2 the load, or part of the circuit? [06:05:54] <JymmmEMC> Ok, if I attached a scope at the point where D1 and C1 meet and removed C2 from the circuit, wouldn't I have a half wave? [06:06:46] <KimK> Well... with AC input/output C2 is odd, but I guess you could call it a float/bias voltage smoother? [06:08:50] <KimK> Yes, I guess you would have a half-wave, D1 would short the negative side, and no float? So half-wave, I'd say. So C2 accumulates charge so the float level can come up? [06:09:43] <KimK> What do you plan to do with the circuit? [06:13:40] <KimK> Yes, like the voltage doublers in figs 7 & 8. Triplers, quadruplers, etc. possible too. [06:48:23] <KimK> I'm not quite sure what he's got going on there. What do you think his problem is? [06:49:23] <skunkworks_> He needs to give a schematic of how everying is connected..
[06:50:14] <skunkworks_> Hi kimk - I don't think we have met. I am sam. [06:51:32] <KimK> I try to hang around here and learn when I can. 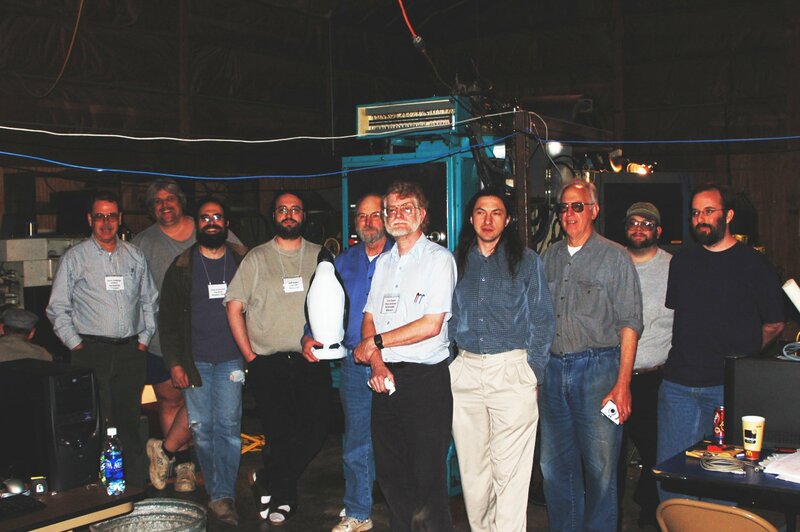 I went to the 2008 CNC workshop, my first time. [06:52:29] <KimK> I heard the 2009 workshop dropped off the webpage, hope everything is OK? [06:53:43] <skunkworks_> have you been to the fest? [06:57:04] <KimK> How long have you been going to the CNC workshops? [06:58:32] <skunkworks_> the workshop site is up - I don't know if he had 2009 info before or not. [06:59:02] <skunkworks_> kimk: what is your project for emc? [07:04:32] <KimK> I heard that 2009 was on the wiki page http://wiki.linuxcnc.org/ but now just 2008. I didn't see 2009 there myself. 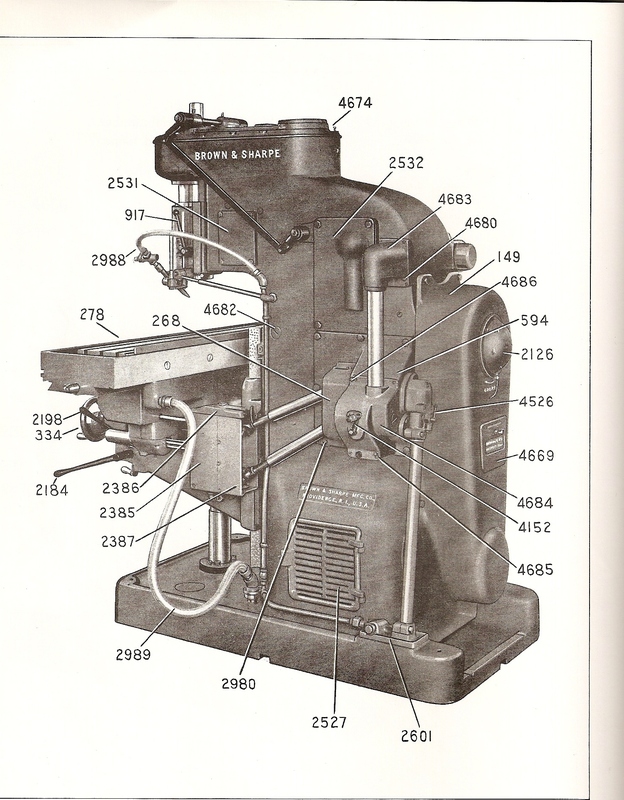 [07:07:45] <KimK> I have done some retrofitting (non-EMC2) in the past and currently am helping a friend with a pair of Kasuga mills (Bandit controls, now dead) and hope to tackle a pair of Cincinnati-Milacron lathes with old paper-tape controls if possible, we'll see. [07:09:20] <KimK> So I'm very interested in EMC2 in the somewhat larger retrofit mode (professional?) No tabletops, no steppers, no parallel port, lots of I/O for complex tool changers. [07:10:23] <skunkworks_> did you take any of rayh's classes? [07:10:54] <KimK> I have a minimum set of the Mesa cards and am just trying them out for the first time tonight. Nothing to report yet, LOL. [07:11:30] <skunkworks_> heh - I have some mesa hardware I have not gotten around to play with. [07:17:37] <KimK> Yes, there he goes, stumbling over the exhibits, tripping on cords, etc. [07:18:03] <KimK> What can I tell you? [07:19:43] <skunkworks_> then going around next behind me - SWPadnos, jmkasunich, jepler, and the back of cradeks head. [07:20:25] <maddash> erm, in that pdf I posted, wtf is the diode doing there? [07:21:39] <KimK> maddash: not at all. What do you plan to do with that circuit, though? [07:24:33] <maddash> no more '!' parsing? [07:46:57] <maddash> KimK: arizona? you're in AZ? [07:47:50] <KimK> I am? Surprise to me. Maybe I'd better whois myself? I'm in Omaha. [07:48:36] <maddash> KimK: isn't your ip (98.161.36.113)? [07:49:20] <KimK> This thing seems to think so. I haven't looked, actually. [09:07:45] <skunkworks> now - sleep time. 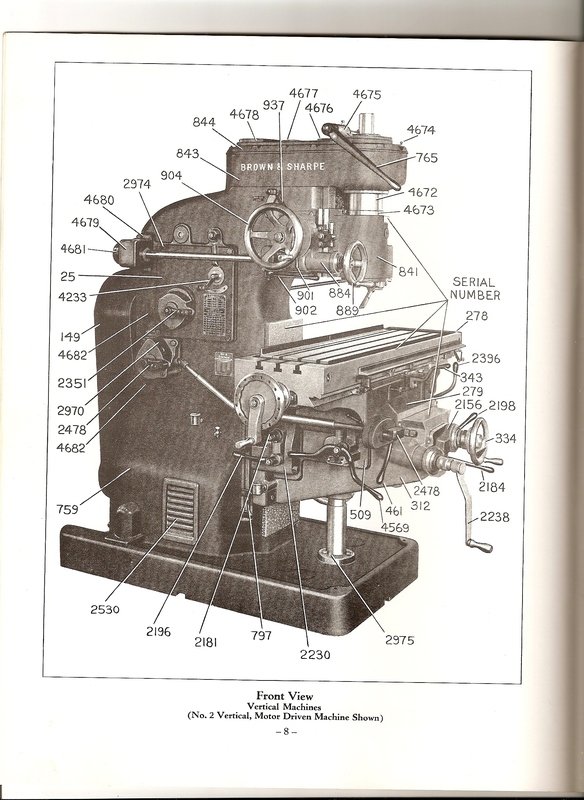 [10:09:45] <anonimasu> archivist: do you have any digitized book on making gears? [10:11:17] <archivist> any particular info? [10:12:14] <anonimasu> not for any special gear size..
[10:16:58] <anonimasu> archivist: I'm thinking that the biggest gear I want to make is 1"
[14:10:50] <JymmmEMC> scrap yards, yeah right. [14:26:15] <fragalot> I read that as "hobby"
[14:31:14] <LesNewell> Hmm, looks like i've just broken something. If I try running any of the sample emc configs, I now just get an error report. [14:31:29] <LesNewell> It looks like the rtapi kernel module isn't loading. [14:36:02] <alex_joni> do you have enough diskpace? [14:36:13] <fragalot> JymmmEMC: does it work? [14:37:09] <LesNewell> alex_joni, yup, loads of space. [14:37:37] <alex_joni> that is during booting..
[14:38:00] <JymmmEMC> alex_joni: Vampires have Christmas Tours? [14:38:25] <alex_joni> and see what is there, someone else will surely pick it up from here..
[14:39:19] <LesNewell> Tried sudo /etc/init.d/realtime start. Got no error messages. [14:45:34] <cradek> what have you changed since emc last worked? [14:48:25] <LesNewell> I don't remember changing anything recently. [14:49:14] <cradek> LesNewell: if you run dmesg in a terminal what is the last line you see? [14:50:11] <cradek> what version of emc are you trying to run? is it compiled or an installed package? [14:51:42] <cradek> which are you trying to run? [14:52:18] <LesNewell> Did a make install. [14:53:08] <LesNewell> I have made some changes to RS274NGC but thst shouldn't affect the rtapi stuff should it? [14:54:27] <LesNewell> I did use run-in-place before but I had problems with Axis not usingg the correct rs274 library. [15:11:53] <LesNewell> I'd like to test this on my lathe. What would be be easiest way to transfer the relevant files across? [15:12:13] <LesNewell> O suppose I could copy the whole emc2-trunk folder onto that machine. [15:16:15] <cradek> it's not hard, but I don't know the state of trunk regarding packages. usually when we make a release branch it takes some time to get it all fixed up and ready. [15:17:46] <LesNewell> That might be a good idea. I need to make a patch at some point anyway. [15:41:57] <cradek> it's still up to us to try installing and running it, right? [15:59:48] <cradek> can you automate the writing of code too? that's what I really want. [16:17:27] <jepler> you didn't use the right flags when doing "cvs up"
[17:11:16] <skunkworks> cradek: what constitutes a dimensioning mill in the gcode.ulp? (if you know off hand). [17:48:27] <jepler> one of the layers is called "dimension"
[19:34:17] <jmkasunich> SWPadnos or jepler: around? [19:34:53] <jmkasunich> do either of you know how much torque they can make? [19:45:43] <JymmmEMC> 120" Screen 3ft from your face! [19:47:20] <jepler> coordinate_font = "-*-lucidatypewriter-medium-r-*-*-20-*-*-*-*-*-*-1"
[19:49:46] <jepler> if you don't mind the dot in the middle of the zero, this doesn't look jaggy on my monitor: coordinate_font = "-*-dejavu sans mono-medium-r-*-*-40-*-*-*-*-*-*-1"
[19:51:03] <jepler> coordinate_font = "-*-courier 10 pitch-medium-r-*-*-40-*-*-*-*-*-*-1"
[19:53:07] <cradek> this reminds me of a conversation that went something like this: <cradek> I added an option for a large coordinate font! now people will quit bothering us about it! <jepler> uh, so you think one of the TWO font options will make everyone happy? <cradek> SHUT UP SHUT UP SHUT UP!! [19:57:35] <cradek> I bet the old CRT based ones were OK. like I see used as POS terminals. [20:05:38] <archivist> I dont want to spoil mine its 17"
[20:08:25] <anonimasu> capacitive is the stuff they use for the iphone right? [20:21:28] <dmess> i need a clacker for a clock can you set me up?? [20:28:09] <LesNewell> Here is a patch lathe diameter mode. [20:30:55] <cradek> did you renumber all the errors over 39? [20:31:39] <cradek> just curious - why not add it at the end? [20:32:17] <LesNewell> Just to keep all the bug msgs together. [20:34:05] <cradek> did you figure out how to make G7 G1 X1 apply to this line, instead of starting at the next one? [20:36:04] <cradek> does G7 G10 L1 P1 X1 still write 0.5 to the tool table? [20:37:31] <LesNewell> I have to admit I didn't test it though. [20:38:15] <LesNewell> I'm not sure. No matter how you do it, diameter is always a fudge. [20:39:37] <LesNewell> My Fanuc 20T only uses dia for X. [20:40:19] <dmess> g76 roughing canned cycle?? [20:41:03] <dmess> threading should still be dia. [20:42:33] <LesNewell> It would seem sensible that I - thread peak is dia. [20:43:01] <LesNewell> Not sure about j and K tho. [20:49:08] <cradek> I think it's standard for incremental I center to be in radius so that's set. but for absolute I center in diameter ...? [20:51:12] <cradek> even in g76? [20:52:48] <LesNewell> It doesn't matter if i,j,k are inc or abs. [20:58:34] <anonimasu> dmess: you mean you just go g3 x30 y30 R15 and not muck around with IJK? [21:04:07] <LesNewell> Sorta makes sense. [21:04:38] <cradek> we have to weigh that against the simplicity of "X=diameter; everything else=radius"
[21:05:33] <jepler> ==31841== No malloc'd blocks -- no leaks are possible. [21:11:03] <LesNewell> However, you can work out the DOC from the thread angle and pitch. That would be radius. [21:15:23] <DanielFalck> I'll see if I can dig something up. [21:17:45] <DanielFalck> how about I do some research right now before we take a vote? [21:20:49] <DanielFalck> dmess: can you give example code for us? [21:22:08] <cradek> going back to my questions in that old thread: X repeats in canned cycles are diameter, right? [21:24:10] <LesNewell> The only effect is that the X is scaled as it is read from the code. Everything else is radius. [21:25:59] <LesNewell> Hmm, That canned cycle works very different. Looks like only X is dia though. [21:26:52] <LesNewell> Why?? They do it to M6 as well. [21:27:46] <LesNewell> I meant, why do they do it. Crazy. [21:28:12] <cradek> what do they do with M6? [21:29:58] <LesNewell> That's what G43 is for isn't it? [21:32:03] <LesNewell> Mind you I can crash a rear post as well as anyone. [21:32:38] <cradek> Q0080 = maximum pass depth This value programmed without a decimal point. [21:43:01] <DanielFalck> cradek: R2.0 then? [22:02:58] <DanielFalck> cradek: so I'm confused about the emc version of I in G76- it says that I is offset from the drive line. We're talking about I,J,K possibly being diameter values right? [22:05:34] <LesNewell> imho it doesn't make sense fro offsets to be dia. [22:10:15] <LesNewell> If I is a diameter and not an offset, shouldn't it be X? [22:11:01] <LesNewell> In that case dia mode would work. [22:12:30] <LesNewell> Looking at the G76 description, I was thinking pretty much the same as you. [22:13:06] <LesNewell> It always struck me as odd that G76 didn't use X at all. [23:17:27] <JymmmEMC> alex_joni: Hey! I got ripped! Where's the 4th dimensaion damnit! [23:23:20] <DanielFalck> how many dimensions can emc do vs mach? [23:25:43] <DanielFalck> is it ahead of the path or behind it? [23:29:40] <skunkworks> cradek: thanks. I just assumed it offset the perimeter the same as the traces. I think I will take a look at that and see if it would be easy to do automagically.